FREE DISNEY SOUVENIRS. I bet the title alone got your attention, right? If you are taking a trip to Disney, you will want to bring back a few mementos from your trip. 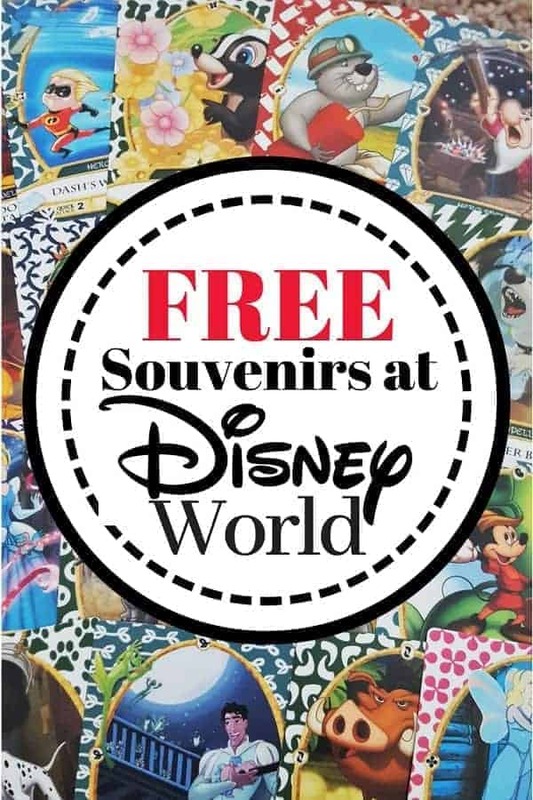 4Sure, you will probably buy something (a t-shirt, a pair of Mickey ears …) but did you know there are FREE Disney World Souvenirs that you can actually take home? There are many things that you can bring home that won’t cost you a penny. 1. Disney Tickets/Magic Bands. If you are staying on resort, you will get a Disney MagicBand that works as your park admission, credit card, access to the Fastpass+ system and Dining Reservations at Disney. At the end of your stay, you get to keep these bands! You can even use them again on a future trip. 2. Celebratory Buttons. If you are staying at a Disney World resort, you can get FREE Disney World Souvenirs by requesting buttons at the front desk. If you aren’t staying at a Disney Resort, you can find FREE Celebratory buttons at the customer service / ticket counter and sometimes on Main Street USA when the park opens. They have them for such celebrations as Birthday, Anniversary, Family Reunion, First Visit, and Honeymoon. Even if it isn’t your birthday, but it is someone’s in your party, you can get an I’m Celebrating pin! One of the perks of wearing these FREE Souvenir buttons is that Cast Members will make you feel even more special by giving you a more personalized greeting. 3. Stickers. 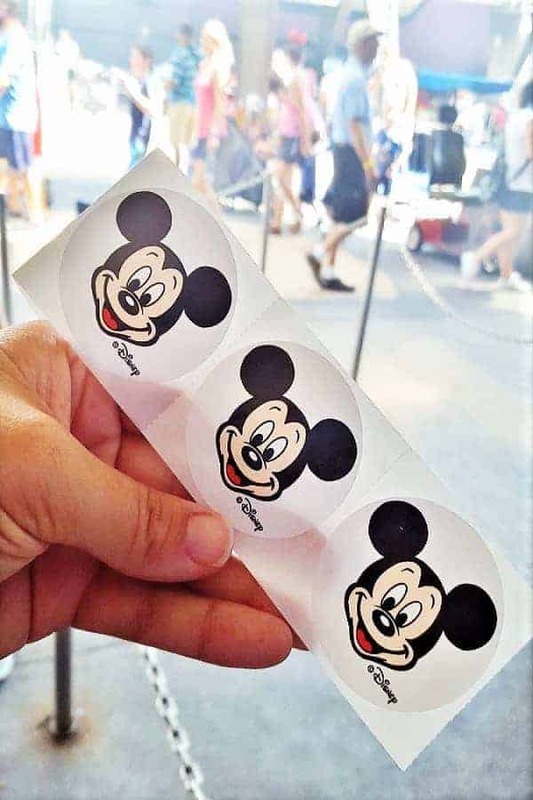 When entering Disney theme parks, many times Cast Members will be passing out Mickey Mouse stickers. We’ve also seen them given out when you enter stores and restaurants inside the parks. When in doubt, ask a greeter or even a photographer! They will give you more than one if you ask and they are great for scrapbooks. 4. Park Maps. These are at the entrance of each park and what I find really cool is that they have Disney Park maps in different languages! Why not pick up one to take home for your scrapbook or put it in a frame as a way to remember your fantastic vacation! 5. 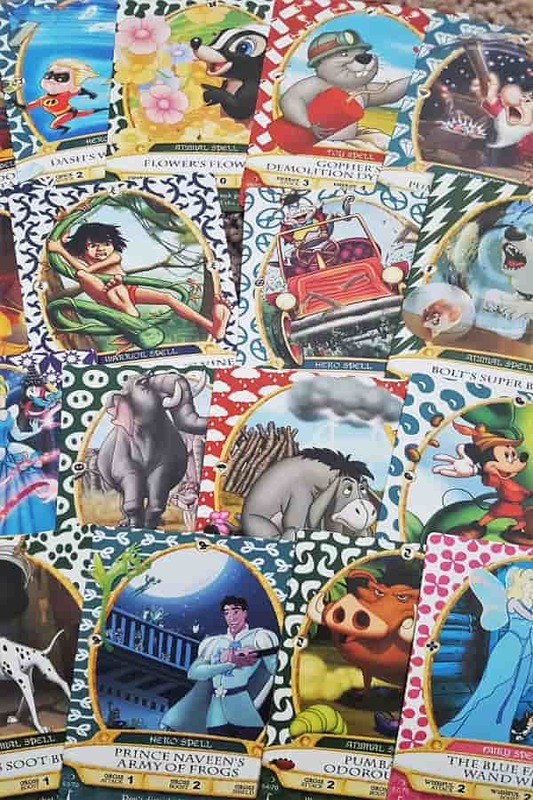 Sorcerers of the Magic Kingdom Cards. If you stop by the Firehouse (on left as you enter Main Street), you can show them your park ticket (or scan Magic Band) to get a set of FREE Sorcerers of Magic Kingdom cards. Most people get them to play the interactive park game, but even if you don’t play, these character cards are collectible and great FREE Disney World Souvenirs! 6. Treasure Map. 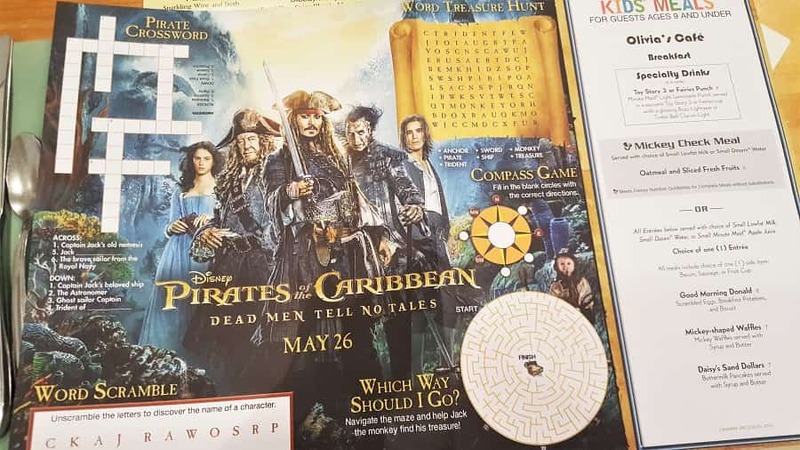 Go to A Pirate’s Adventure in Magic Kingdom and get a free treasure map to Adventure Land. 7. Mardi Gras Beads or Lei. If you are staying at Port Orleans, French Quarter, you will get free Mardi Gras beads. If you visit Polynesian, you will get a free Lei when you check in. 8. Picture. If you are a Disney Chase Visa Card holder, you can go to an exclusive Meet & Greet at Epcot and at Hollywood Studios. You will also get a voucher for a free photo! 9. Wilderness Explorer Field Journal. At Animal Kingdom, kids can take part in an adventure learning about Animals and their habitat through their Wilderness Explorer Program. 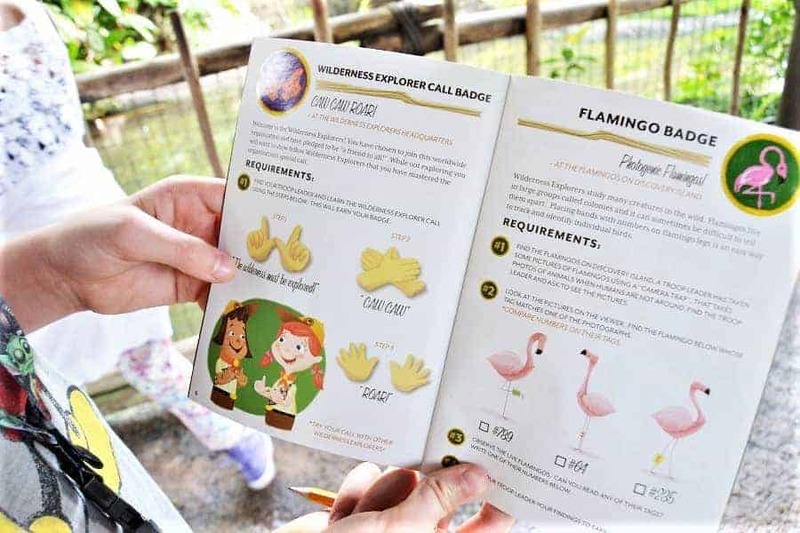 Each guest can pick up a Field Journal at the Wilderness Explorer headquarters (located on the bridge between the Oasis and Discovery Island) and gather stickers as they complete various activities through the park. 10. Shampoos & Soaps. Those staying at resort can get FREE Disney Shampoos, lotions & soap. Use them and save the shampoo bottles to refill with your favorite shampoo so that you can take a little Disney where ever you go! 11. Bookmark. If you go to Enchanted Tales with Belle, you will not only get to have a meet & greet with the princess (with a picture), you will also get a FREE bookmark! 12. Children’s Activity Menus. When you go to a sit down restaurant at Disney, your child will get an activity menu. If your child is too busy to work on the activity menu during their meal, then be sure to pack it to take home. They can be used later while you are back at your room or on the car/plane ride back home! You can even take home the crayons. 13. Jedi Diploma Certificate. While at Hollywood Studios, your child can try to battle Darth Vader at Jedi Academy. If chosen to participate, your child can walk away with an official Jedi Diploma certificate. It is a perfect souvenir to frame. 14. Pixie Dust. Stop by the Disney Store at Disney Springs and ask for a FREE Fairy Dusting from the ladies at the Bibbidi Bobbidi Boutique. You can find similar fairy dusting at the Barber Shop on Main Street in Magic Kingdom. 15. Duffy Bear Coloring. At Epcot, check out the Kidcot Fun Stops. There you will find FREE coloring souvenirs for the kids. They can decorate Duffy Bear at each country in the World Showcase. When take their Duffy to each country, the cast member at the Kidcot Fun Spot will stamp the back. If you ask, they will also write your name or a greeting in their native language. What are some other FREE Disney World Souvenirs you’ve found in the park? We’ve never been to WDW but we love the buttons from DL! Great list, thanks! That is fun for the kids! Mine save their Disney Gift cards from birthdays and holidays to spend at the park. It makes them happy to spend their money on whatever they want. My family always gets the refillable cups! We figure we’re going to drink our body weight in drinks anyways, and it’s fun to see how the designs change every year! When we went on Buzz Lightyear’s Space Ranger Spin, one time with my mom, she got a certificate that said Happy Birthday because a cast member noticed that she was wearing her “It’s My Birthday” pin. I’ve gotten a free dessert when I wore mine but that was a few years ago. You can also get a call from Goofy for your birthday if you ask a cast member to put you through to him. At least, we’ve gotten that twice. Once at Animal Kingdom, and once in the American Pavilion at Epcot’s World Showcase. If you ask at Guest Services, they have Safety cards with Timone and Pumbaa on them, with messages like, “Don’t wait too late to hydrate,” and “It’s a rope, not a ride,” among others. I think there are 12 or 15, total. Each of the watercraft have transportation cards, if you ask the captain or any cast member on board or at the entrance/exit of the boat. I think they have one for each of the monorails, too. It used to be that you could sit up in the very front of the monorail and get a Co-Pilot card. I know they did away with passengers at the front, but you may still be able to get the card. You can get a list of all the penny presses for the park by going to Guest Services. If you get your child’s first haircut at the Barber Shop on Main Street, next to the Emporium, the child will receive a certificate , which has the baby Disney Characters Fab 5 on it. It’s adorable. At Disney Springs, they give out free samples of chocolate squares at Ghirardelli Chocolate Store. If you buy a hat at any of the shops, they’ll usually embroider it for free, just ask a cast member or Guest Services where you bought it for directions to where to get it embroidered. At Magic Kingdom, they have a spot by the hat shop on Main Street. I know Disney Springs has a place, too. Speaking of buying things, you can ask if they have any of the Mickey head shaped confetti to throw in the bag – it goes great for scrapbooking. If you don’t want to carry around all the stuff you’ve bought in the park, just have them send it to Guest Services for pick-up. If you’re staying on property, they’ll send it to your room, I believe, too. There’s a lot of stuff to do at each of the on-property resorts. Some of the resorts have s’mores and campfire stories. Boardwalk has magic shows and juggling and other street performers. And some of the resorts have free movie nights outside. Disney Springs has concerts and a splash pad for the kids to play around in. I think Fort Wilderness has hayrides. Most of the resorts have a fun little club house to go and play air hockey, pool, table tennis, video games, board games, shuffleboard, hula hoop, activity and coloring, watch movies, etc., besides just enjoying the swimming pool. They also have pin trading boards available at most of them. I didn’t know they did free embroidery! I definitely need to get this done next time! Thanks for adding your tips! THey are awesome. Thanks for all the tips it will help us next month when we come to wdw. If you don’t have kids but as an adult you want to act like a kid while your there can the adults participate in the kids activities as well? Of course! Disney wants all of their guests to feel the magic! Believe me, they encourage you to feel your inner child spirit!